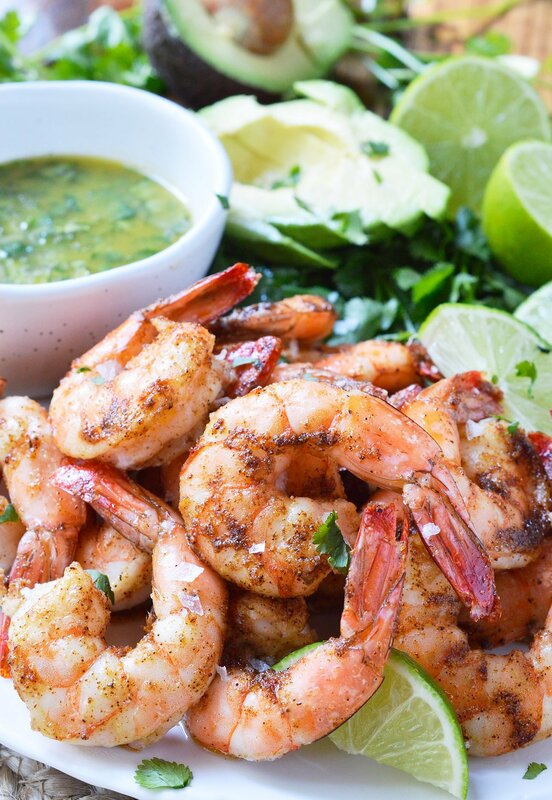 For punch in the face flavor, make these Cilantro Lime Spicy Baked Shrimp! 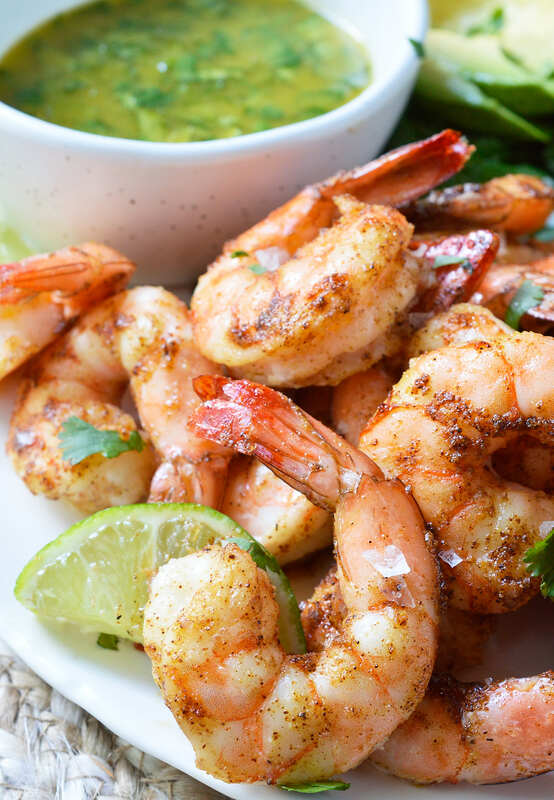 This Whole30, Paleo compliant recipe starts with shrimp covered in spices, baked to perfection then served with a fresh cilantro lime dip. Perfect for a healthy lunch, dinner, appetizer or a snack! This post originally published February 5, 2017. This post contains affiliate links. This is the type of meal I love to eat when I’m maintaining a healthy diet. 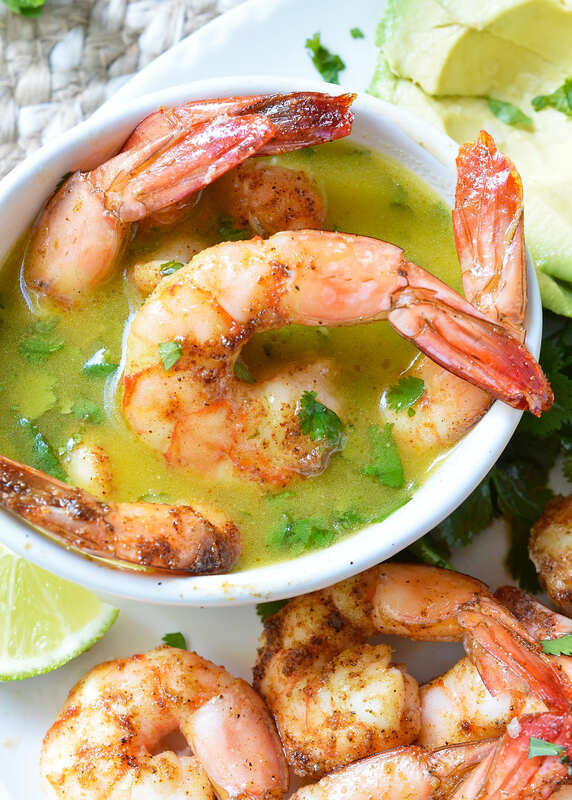 These Cilantro Lime Spicy Baked Shrimp are extremely easy to prepare and pack a ton of flavor in each bite! These shrimp are beyond simple to prepare. 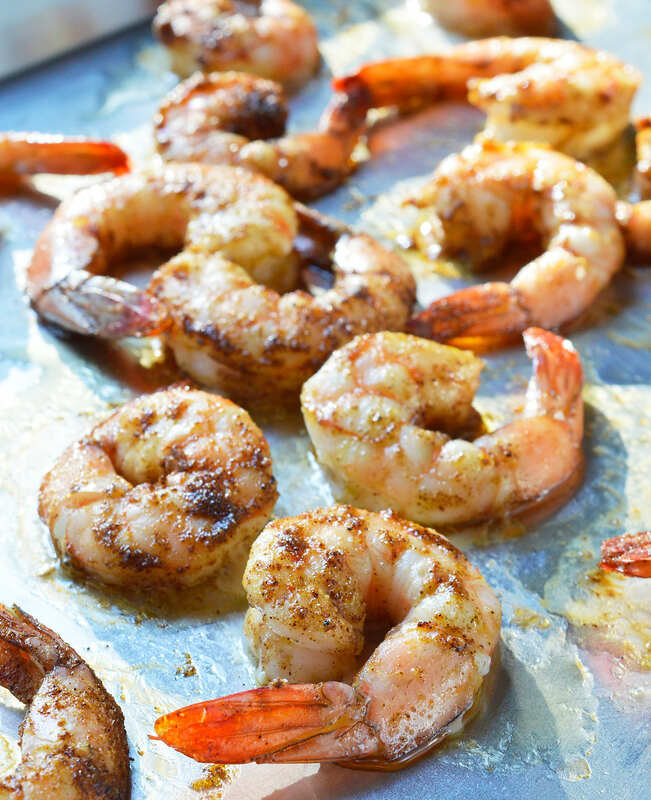 Just toss shrimp in oil and spices, bake then serve. The Cilantro Dip is blend of fresh cilantro, lime and olive oil. I could bathe in this cilantro lime dip. Seriously, just slather it all over . . . it is un-freaking-believable! I followed the Whole30 diet during the month of January (with the exception of a few cheats. . . just a few). On the days that I dedicated the time and effort to meal preparation I did not feel deprived at all. However, on those busy stretches that I did not have time to prep it was brutal and I became used to a growling stomach. In the end I called it The Inconvenient Diet. It was a lot of work to follow but I will say it has been successful. There is no denying my results. I don’t own a scale but I am down about 2 sizes. I feel so much better! I have officially kicked my crazy sugar cravings, I have more energy and my skin has not looked this good, like, ever. In fact, I’m pretty sure either sugar, dairy or both are terrible for my skin, causing breakouts, wrinkles and ruddiness. Moving forward I plan to eat more in the Paleo and/or Mediterranean Diet style. But, 2-3 days a week I will commit to the Whole30 eating plan. 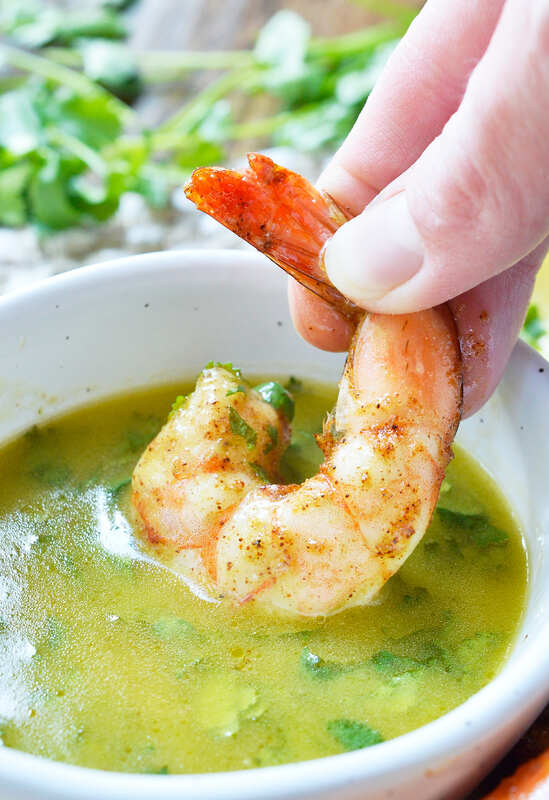 I will fill those days with a few of my favorite recipes like these Spicy Baked Shrimp with Cilantro Lime Dipping Sauce, Lemon Dill Zoodles, Lemon Garlic Chicken Drumsticks or Pork Fajita Bowls. Can this be prepared ahead? Yes! This is perfect for meal prep because it tastes great warm or cold. In fact, I prefer it cold. I list olive oil or avocado oil in this recipe. My preference is avocado oil because it just a bit lighter and has basically zero flavor. What tools do you need for this recipe? I use these to make this recipe: Nordic Ware Rimmed Baking Sheet , OXO Good Grips 9-Inch Whisk Citrus Juicer/Squeezer – Stainless Steel and Microplane Citrus Zester . This is great for meal prep, I use these Glass Meal Prep Containers with Lids . Not only are these Spicy Baked Shrimp great for a healthy meal plan, they make a fantastic appetizer for parties! These shrimp are great alone, on a salad, over rice or pasta. If refrigerating the cilantro lime dip, take out 30 minutes prior to serving to allow the oil to warm up and liquify. There you have it! You are on your way to completing a round of Whole30. It can seem daunting (especially half way through). But if you find a handful of recipes that you love and can rotate during the month, it makes it so mush easier and more enjoyable. It’s not about what you can’t eat . . . lets focus on what you can eat. You can do this! Yummmmmm, I’m adding all of these to my Whole30 Menu! For punch in the face flavor, make these Cilantro Lime Spicy Baked Shrimp! This Whole30 compliant recipe starts with shrimp covered in spices, baked to perfection then served with a fresh cilantro lime dip. Perfect for a healthy lunch, dinner, appetizer or a snack! Rinse and Drain thawed shrimp. 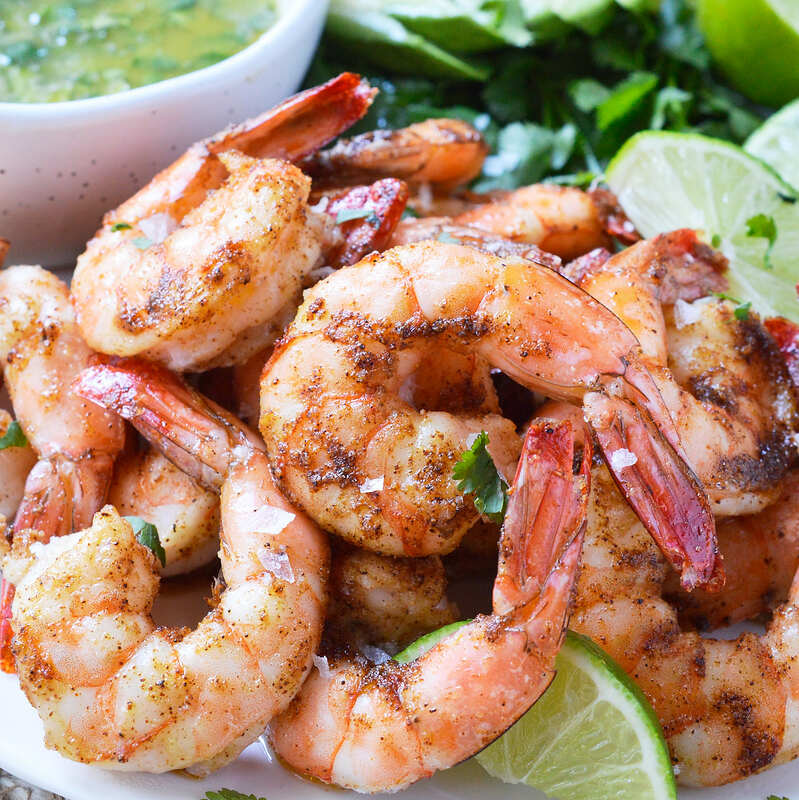 Toss shrimp with oil and spices. Transfer to a rimmed baking sheet. Bake 8-10 minutes (depending on size) or until shrimp are pink and in a loose 'C' shape. Whisk all ingredients for 1-2 minutes. This shrimp sounds fantastic! I love all of those flavors. Thanks for including my soup in your Whole30 recipes too! I haven’t ever done Whole 30 but it’s pretty close the way I try to eat. (I do eat cheese though; not sure if I could give up cheese!) I like your moderate approach of doing it some of the time. And this shrimp looks like a dish that will definitely keep you from feeling deprived! Thanks for including my Garlic Lemon Herb Grilled Chicken Breast in your collection of Whole 30 ideas;I have made that so often! Uuughh. Cheese is the hardest part for me. I’m a total cheese addict! Amazing! We tried it tonight, and it will definitely make an appearance again.